First time buyer? 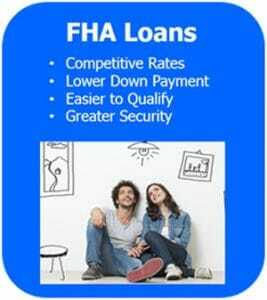 An FHA loan can help you afford more and pay less. You must be able to document your income. Documentation of your rental payment history, or mortgage payment history if you already own a home. Credit score of 600 or better, although we can sometimes help people with slightly lower scores. Documentation showing you have the funds for at least the minimum down payment of 3.5%. The total of your house payment, plus your other monthly loans and credit card payments (also known as your DTI, or Debt to Income ratio), generally cannot be more than 43% of your income. You cannot have had a bankruptcy within the last 2 years (Chapter 7), or within the last 1 year for a Chapter 13 bankruptcy – with written permission from bankruptcy court to enter into the mortgage transaction. Basically, the FHA wants to make sure you can pay your bills (including your mortgage). The FHA will often accept a letter explaining the circumstances, if there is a problem with your payment history. The down payment may be from the borrowers own savings, or it may be gifted from a family member. FHA loans lower interest rates than a sub-prime loans. FHA also offers fixed interest rates, compared to many sub-prime mortgages which have adjustable rates. These adjustable rate mortgages (ARMs) can cause your interest rate to jump, raising your monthly payments without warning. In addition, the majority of sub-prime mortgages carry a heavy prepayment penalty which makes it too expensive for many homeowners to refinance to a better rate. FHA loans have no prepayment penalties, so you can refinance your home loan at any time without penalty. The FHA home loan program makes it possible for people with less than perfect credit to qualify for mortgage financing. Conventional loans are more difficult to qualify for, and often require a greater down payment compared to the the 3.5% required for an FHA home loan. Would an FHA loan be the right choice for you? We can help you understand your options and choose the loan program that best meets your needs and your financial goals. To see if you qualify, you can complete our simplified intake form here, or call the The Bjornson Team at 360-676-9600.